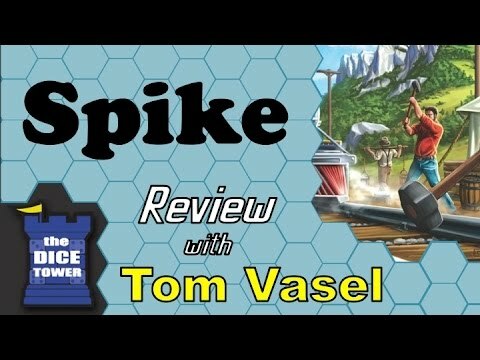 Spike társasjáték - Magyarország társasjáték keresője! A társasjáték érték! A Spike egy nagyszerű társasjáték, 2 - 4 játékos részére, az átlagos játékidő rövidebb, csak 1 óra. A társast, 14 éves kortól ajánljuk kipróbálni. A játékmenet erősen épít a fogd és vidd és az útépítés mechanizmusokra. 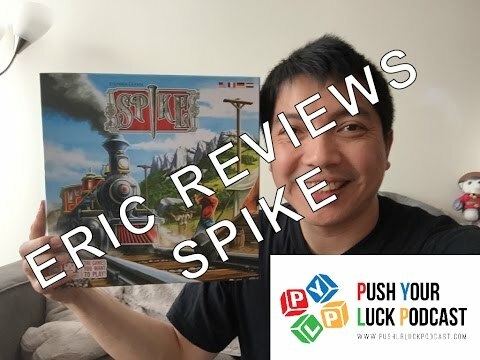 It's the early 1900's and you are the owner of one of the fastest growing rail companies in the eastern USA. 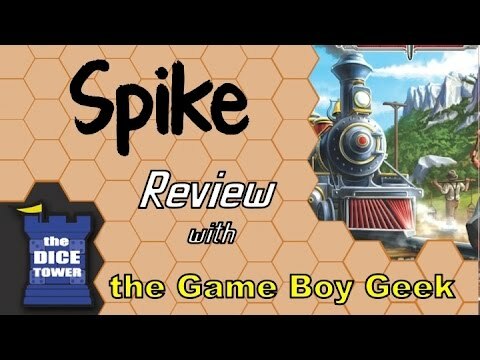 In Spike, you expand your rail network as you connect cities in order to pick up and deliver more goods; complete contracts and routes to bring in money to modernize your train; upgrade your engines, tenders and railcars to transport the most freight; and build farther, transport more, and amass wealth on your way to become "King of the Rails". Randomly distribute the 12 goods tokens into the chart on the board. Shuffle track deck, place 4 in display. Place the 3 game timer cards on the track on the board, the first one face up. ... gets a random contract showing a starting city, an end city, and several cities along the way. At end of game, earn $ based on city furthest along path to which you connected, +$1 per city along the way. ... gets 3, 4, or 6 (4, 3, or 2 players) contracts, all of which correspond to a different type of good. Contracts have several possible destinations, paying more $ for more distant deliveries. - If you have a train on the tracks, advance it up to a number of spaces equal to engine level (1 at first; max 3). ... Move only along your own tracks. ... May not change direction while on track. ... As you move, may jump over cities you don't want to enter. ... If you enter a city, may deliver a good on your train; earn $ according to value showing on contract. ... You may only deliver to any particular city ONCE; may only deliver each type of good ONCE. 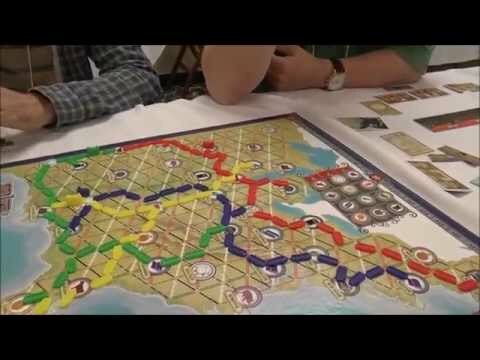 ... build track: play track cards corresponding to tracks on the board; must build a complete link to a city. May play n+1 cards of one type, to count as n cards of another type. The first time you connect to a city, move the corresponding track marker to the bottom row of the chart; earn $1-3 depending on which row the marker started on. Shift the other markers up to fill in the empty space. When the draw deck runs out, flip the next round marker card face up. Shuffle the Display and the discard pile and create a new Display and draw deck. When the 3rd timer is face up, shuffle all 3 into the bottom half of the new draw deck. When the 3rd card is drawn, the game ends immediately. The player with the most money (tracked on score track) wins. 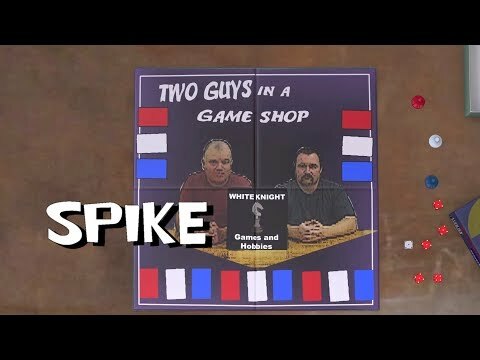 Two Guys in a Game Shop Review "Spike"